Plug-in electric vehicles (PEVs) are sustainable alternatives to internal combustion engine vehicles thanks to the use of environmentally-friendly electric energy and the reduction of off-gas emissions. One of the major concerns associated with the adoption of PEVs is the distance limit, i.e. the fact that PEVs may not be able to complete trips without recharging. In this study, we propose to model the assignment of mixed-vehicular traffic of PEVs with two different charging capabilities accounting for PEV range constraints. We consider two recharge modes: charging stations with recharge time and modern charging lanes where PEVs are recharged automatically by traversing the lanes. The main objective of this study is to explore the influences of multi-modal recharge service provision on individual trips and network performance. First, a network transformation method is proposed to incorporate recharge decisions within the PEV route choice model. Second, we develop a novel convex programming formulation for mixed-vehicular traffic assignment accounting for en-route multi-modal recharge, derive mathematical properties and propose solution algorithms. In this rich traffic assignment framework, PEV route choice is represented as a resource-constrained shortest path subproblem with recharge time and we identify a suitable exact algorithm to solve this subproblem during the assignment process. Finally, computational experiments are conducted to demonstrate the performance of the proposed models and algorithms. 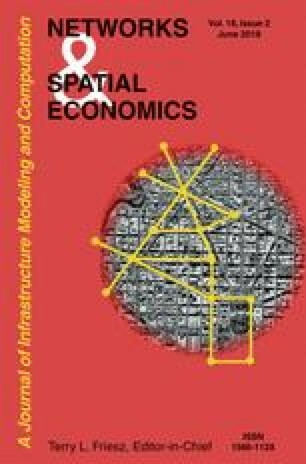 The numerical results reveal that the incorporation of PEV multi-modal recharge has a significant impact on both route choice strategies and equilibrium flow patterns, wherein influencing factors include the distance limit, deployment of charging stations and charging lanes, and recharge time. In addition, we identify counter-intuitive configurations with regard to the way range constraints and recharge time reshape the equilibrium network flows. This research was funded by the Australian Government through the Australian Research Council’s Discovery Projects funding scheme (project DP190102873).